Storytelling Concerts by Santa, Story Concerts by Roseco the Leprechaun, and Tales of Florida Ghosts and Characters. Ross Tarr - Is a second-generation professional Santa Claus and Leprechaun and a teller of American and Florida history and ghost tales. His background as a bookshop owner, university educator, and healthcare facilities administrator has provided a wealth of experiences from which he has accrued many stories. As a social historian, writer, and performance artist Ross tells tales of Florida characters, ghosts, historic leaders, villains, and characters caught between myth and history. Ross served as the Executive Director of the 2016 St. Petersburg StoryFest and the World Storytelling Day Celebration in St. Petersburg, Fl. 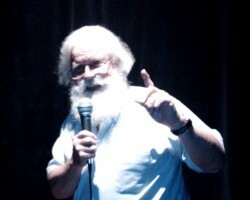 and has appeared at the Florida Storytelling Festival, the historic Tampa Theatre, the St. Petersburg Museum of Fine Art, the Glazer Museum of Tampa, The International Santa Claus Convention, served as Santa at one of New York's biggest malls, appeared in films and commercials, and has appearances at colleges, libraries, and community events. Travel and Fees by arrangement. Limited availability during the Santa season November-December.